Below are the best hotels in Miraflores, in Lima that is conveniently located near many attractions and are within walking distance to the beaches of Costa Verde. Trendy travelers looking for upscale boutique properties should stay at the Tierra Viva Miraflores Larco or Del Pilar Miraflores and luxury boutique options include the newer Dazzler Lima and Casa Andina Premium Miraflores. Solid mid-range options for families include the Courtyard Lima Miraflores and the El Pardo DoubleTree by Hilton Hotel and the Four Points by Sheraton Miraflores offers value with a complimentary breakfast. The luxurious JW Marriott Hotel Lima, the mid-range Estelar Miraflores Hotel as well as the Sol del Oro Hotel and Suites sport resort style amenities onsite including freshwater swimming pools, fitness centers and spas. Read on for best places to stay in Lima, Peru! If you are searching for a mid-range family-friendly hotel in Miraflores that boasts easy access to several area attractions including the Pacific Ocean then the Courtyard Lima Miraflores is superb. Located in the center of the Miraflores District along Calle Schell, the Courtyard Lima Miraflores provides for an easy 50minute walk to Parqu Kennedy and less than 1-mile away from Playa Redondo II. The Courtyard Lima Miraflores has a sleek modern ten floor architectural style with 149 rooms and suites that feature a fresh contemporary decor. Standard rooms are spacious with a choice of bedding and views of the city. Panoramic rooms are a larger corner unit with a choice of bedding, sofa sleeper and views of the city through floor to ceiling windows. One-bedroom Panoramic suites have a separate living room with a sofa sleeper and floor to ceiling windows that boast of city skyline view. The Courtyard hotel in Miraflores is a great spot to begin your explorations of the area with several quality attractions within a short walk which include the ruins at Huaca Pucllana, the Iglesia Virgen Milagrosa and the beaches of Costa Verde which include Playa Waikiki as well as Playa Makaha. The Courtyard Lima Miraflores has a fitness center but not a freshwater swimming pool. Dining onsite includes Bistro 400 for all three meals and there are several eateries within a short walk such as Barra Maretazo for seafood, Mama Olla Restaurant prepares Peruvian specialties as well as Rigoletto Lima serves Italian cuisine. Nightlife nearby includes drinks at Delfus Taberna Bar or Cafe Bar Habana and there is live music at Son de Cuba. When you want to stay at a trendy boutique hotel in Miraflores that is close to numerous attractions including the beach then an ideal place to sleep is the Tierra Viva Miraflores Larco. Located in the heart of the Miraflores District along Calle Bolivar, the Tierra Viva Miraflores Larco is situated less than a 10-minute walk from Parque Kennedy and is a short half-mile to Playa Waikiki. The Tierra Viva Miraflores Larco has a modern eight story architectural design with 44 rooms that sport a simple contemporary interior. Standard rooms have 204 square feet with a choice of bedding and views of the city. Superior rooms are slightly larger at 236 square feet with a choice of bedding and views of the city skyline. The Tierra Viva Miraflores Larco is an ideal hotel in Miraflores to start your adventures with several attractions within a short distance that include Parque del Amor, shopping at Larcomar Shopping Center, the Miraflores Boardwalk and the ChocoMuseo Miraflores. The Tierra Viva Miraflores Larco has a rooftop terrace but does not offer amenities such as a freshwater swimming pool or a fitness center. 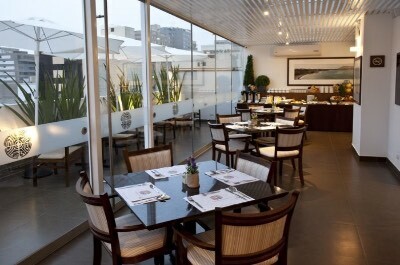 Dining at Tierra Viva Miraflores Larco includes a complimentary breakfast but there is no restaurant onsite. There are numerous eateries within a short walk such as Punto Azul for Peruvian delights, El Pez On prepares seafood and Maido serves Japanese cuisine. Nightlife nearby includes gambling at the Casino La Hacienda, the Jazz Zone has live music and you can watch live performances at the Centro Cultural Ricardo Palma. If you want to find a luxury hotel in Miraflores that is family-friendly with numerous amenities onsite and is close to numerous attractions including the beach then the JW Marriott Hotel Lima is a superb choice. Located in the southern portion of the Miraflores District along the Malecon de la Reserva, the JW Marriott is only 1-block away from Playa Redondo II and is 1-block from shopping at the Larcomar shopping Center. The JW Marriott Hotel Lima has a modern twenty five floor architectural style with 300 rooms and suites which feature a sleek contemporary decor. Deluxe rooms have 355 square feet with a choice of bedding and views of the Pacific Ocean or city skyline. Prime rooms are 398 square feet with a choice of bedding and views of the ocean. Executive rooms are sized at 387 square feet with ocean views and provide access to a private lounge which serves a complimentary breakfast as well as an evening reception. One-bedroom suites have 904 square feet with a separate living room, executive lounge privileges as well as views of the Pacific Ocean from picture windows and some suites area available with a private Jacuzzi. The one-bedroom Presidential suite is 2,819 square feet with a separate living room, 1.5-bathrooms, dining room, executive lounge privileges and views of the ocean. 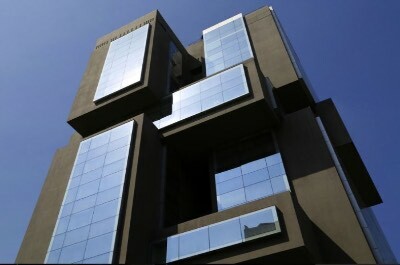 The JW Marriott Hotel Lima is ideal place to begin your explorations with several attractions within walking distance that includes the Lima Museum of Contemporary Art, Parque del Amor and you are steps away from the southern beaches of Costa Verde. The JW Marriott Hotel in Miraflores has a freshwater swimming pool with a sundeck, a fitness center and a full service spa onsite. Dining at the property includes the La Vista Restaurant for all three meals and the JW Sushi Ceviche Lounge prepares lunch as well as dinner. There is an abundance of offsite restaurants within walking distance such as Tanta for Peruvian fare, Mangos prepares seafood and La Trattoria di Mambrino serves Italian. Nightlife within an easy walk includes the Delfus Taberna Bar, Del Carajo boasts dancing and the Jazz Zone offers live music. If you are searching for a mid-range hotel in Miraflores that is close to the beach and numerous attractions which are family-friendly then the El Pardo DoubleTree by Hilton Hotel is superb. Located in the heart of the Miraflores District along Calle Independencia, the El Pardo DoubleTree by Hilton Hotel is situated within a 20-minute walk to the Playa Costa Verde as well as the Playa La Pampilla and you are only 15-minutes away from the ChocoMuseo Miraflores. The El Pardo DoubleTree by Hilton Hotel has a modern twelve story architectural design with 240 rooms and suites that offer a stylish contemporary interior. Rooms are 258 square feet with a choice of bedding and views of the skyline through picture windows. Junior suites offer 280 square feet with a privacy curtain that separates the living room which contains a sofa, some units are available with a kitchenette and each unit offers views of the city skyline. One-bedroom suites are spacious with a separate living room, dining area and views of the skyline through floor to ceiling windows. The El Pardo DoubleTree by Hilton Hotel in Miraflores is perfect to help you begin your adventures of the area with several attractions within 1-mile which include Parque Kennedy, the Miraflores Boardwalk, the ruins at Huaca Pucllana and shopping at the Indian Market. The DoubleTree by Hilton Hotel has a rooftop freshwater swimming pool with a sundeck that overlooks the city skyline, a fitness center and a squash court. Dining at the hotel includes Zuma Grill for breakfast and the El Lobby del Pardo serves lunch as well as dinner. Eateries offsite are plentiful within walking distance which includes Panchita for Latin dishes, La Gloria prepares seafood and Marchand Restaurant serves French delicacies. Nightlife nearby includes Bizarro for dancing, Son de Cuba has live music and BarBarian Miraflores serves cold craft beers. 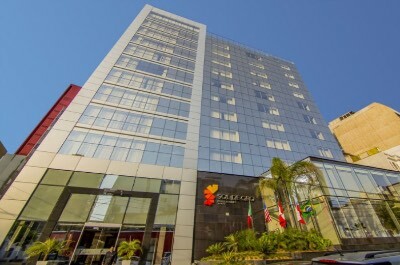 If you are looking for an upscale hotel in Miraflores that offers quick access to many of the attractions including the beach then the Dazzler Lima is a great selection. Located in the Miraflores District along Avenida Jose Pardo, the Dazzler Lima is within a 10-minute walk to Playa La Pampilla and is situated 0.5-miles from Parque del Amor. The Dazzler Lima was constructed in 2013 with a modern seventeen floor architectural style that contains 140 rooms and suites which boast a sleek contemporary decor. Classic rooms are sized at 323 square feet with a choice of bedding and a view of the city from picture windows. Classic Triple rooms have 398 square feet three beds and a view of the city through picture windows. Suites are 398 square feet with one-bedroom, a separate living room, wet bar and views of the city. The Dazzler Lima is an ideal place to start your explorations with numerous attractions within walking distance that include the ChocoMuseo Miraflores, the ruins of Huaca Pucllana and the Amano Pre-Columbian Textile Museum. 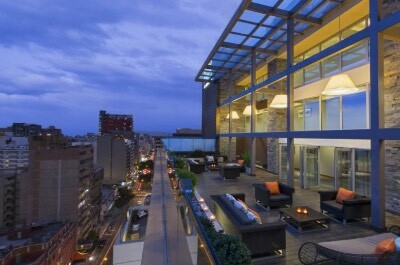 The Dazzler Lima Hotel in Miraflores has a rooftop freshwater swimming pool with a terrace overlooking the city skyline, a fitness center and in-room spa services are available. The Dazzler Lima provides a complimentary breakfast buffet and there is the 21.02 Resto and Lounge which serves lunch as well as dinner. Offsite dining includes a variety of restaurants within walking distance such as Costazul Seafood, the Edo Sushi Bar prepares Japanese and IK Restaurante serves Peruvian Fusion cuisine. Nightlife is abundant nearby with the La Esquina Wine Bar, the Crocodrilo Verde and La Destileria for cold libations. When you are interested in a luxury boutique hotel in Miraflores that boasts resort style amenities, is close to the beach and there are numerous attractions nearby then the Casa Andina Premium Miraflores is an ideal choice. Located along Avenida La Paz in the center of the Miraflores District, the Casa Andina Premium Miraflores is situated within walking distance to the Costa Verde where you will find Playa Redondo II and is within 0.5-miles away from Parque del Amor. The Casa Andina Premium Miraflores has an eclectic modern high rise architectural design with 148 rooms and suites that feature a contemporary rustic interior. Traditional and Superior rooms range in size from 258 to 279 square feet with a choice of bedding and views of the city skyline from large picture windows. One-bedroom suites have 678 square feet with a separate living room and views of the skyline (senior suites have a Jacuzzi). The Casa Andina Premium Miraflores is a superb place to help begin your adventures because there are numerous sites within walking distance that include Parque Kennedy, ChocoMuseo Miraflores and you are less than 1-mile away from the ruins at Huaca Pucllana. The Casa Andina Premium Hotel in Miraflores has an excellent indoor freshwater swimming pool with a waterfall, a fitness center and a full service spa. Dining onsite includes a complimentary breakfast and all three meals served at Alma Restaurante and Bar as well as at Sama Restaurante Cafe. Offsite eateries within a short walk include Bistro 400 for American dishes, Saqra serves Latin delicacies and La Tiendecita Blanca prepares European cuisine. Nightlife includes an easy walk to the Centro Cultural Ricardo Palma for live musical performances; Cafe Bar Habana has great libations and Amadeus Piano Bar for a friendly atmosphere. When you are seeking a mid-range hotel in Miraflores with lots of amenities, within walking distance to many attractions and is ideal for families then the Estelar Miraflores Hotel is an excellent selection. Located in the middle of the Miraflores District along Avenida Alfredo Benavides, the Estelar Miraflores Hotel is less than 1-mile away from Playa Makaha and is a 2-block walk to Parque Kennedy. 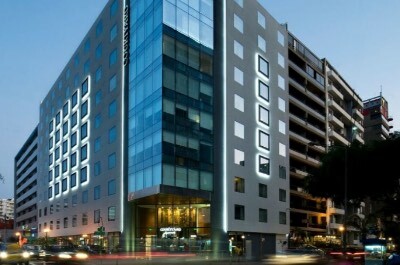 The Estelar Miraflores Hotel has a modern twenty one floor architectural style with 151 rooms and suites that feature a simple contemporary decor. Rooms are sized at 290 square feet with a choice of bedding and a view of the city from large picture windows. Superior rooms are slightly larger at 312 square feet with a king size bed, a sitting area and views of the city. Junior suites are spacious at 441 square feet with a separate living room that offers views of the city through large picture windows. One-bedroom Premium suites are 559 square feet with a separate living room and views of the skyline through large picture windows. The Estelar Hotel in Miraflores has a perfect location to help you explore the surrounding sites with easy walks to the Costa Verde where you will find Playa Waikiki, Parque del Amor and you are less than 1-mile to Huaca Pucllana. The Estelar Miraflores Hotel has a tropical themed freshwater swimming pool with a waterfall, a fitness center and a full service spa onsite. Dining includes a complimentary breakfast at Piso 21 which is open for all three meals and resides of the 21st story of the building. Offsite eateries within an easy walk include Maido for Japanese, Manolo prepares Peruvian delicacies and Punto Azul serves Latin fare. Nightlife is a short away with the Jazz Zone offering live music, La Destileria for cold libations and families will enjoy Bowling Larcomar. If you are interested in a hotel in Miraflores which is great for families and is nearby to many of the attractions as well as the beach then you should try the Four Points by Sheraton Miraflores. 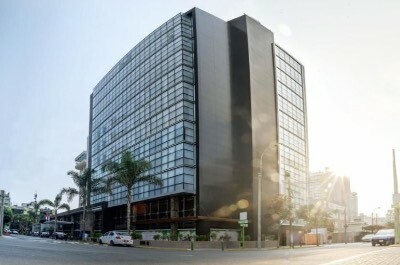 Located along Calle Alcanfores within the heart of the Miraflores District, the Four Points by Sheraton Miraflores is within an easy walking distance to Parque Kennedy and Playa Redondo II. 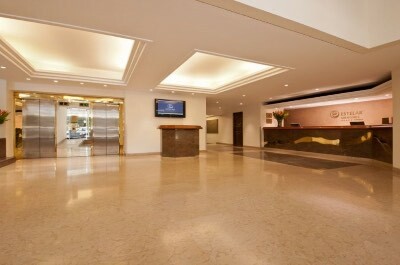 The Four Points by Sheraton Miraflores has a modern fifteen story architectural design with 134 rooms and suites which boast a contemporary interior. Classic rooms range in size from 260 to 280 square feet with a choice of bedding and a view of the city from picture windows. One-bedroom suites are between 673 to 699 square feet with a separate living room and views of the skyline. There are also suites that offer a private terrace with more outdoor living space. 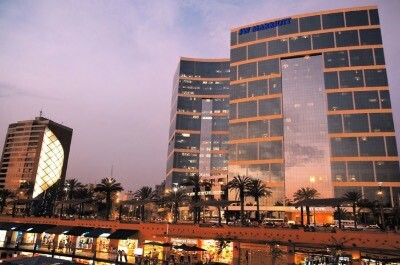 The Four Points by Sheraton Miraflores has a superb location to help you with your explorations with numerous attractions within 1-mile that include the Miraflores Boardwalk, shopping at the Larcomar Shopping Center, Huaca Pucllana ruins and the Indian Market. The Four Points by Sheraton Hotel in Miraflores has a fitness center and spa services can be requested but there is no freshwater swimming pool. Dining includes a restaurant that is open for all three meals with Peruvian delights and there is plenty of dining options within a short walk that include Mama Olla Restaurant for Fusion dishes, Saqra prepares Latin specialties as well as Rigoletto Lima serves Italian. Nightlife within an easy walk includes the Jazz Zone for live music, Casino La Hacienda and La Esquina Wine Bar prepares a quiet drink. When you are interested in a mid-range hotel in Miraflores which is ideal for all types of travelers, is close to several attractions and offers a quick walk to the beach then you should stay at the Del Pilar Moraflores Hotel. Located in the heart of the Miraflores District along Pje Martir Olaya, the Del Pilar Miraflores Hotel is situated within 1-block of Parque Kennedy and 2-blocks to the ChocoMuseo Miraflores. The Del Pilar Miraflores Hotel has a modern eight floor architectural style with 53 rooms and suites that boast a contemporary decor. Standard rooms have various sizes and are available with bedding options from one to three queen size beds as well as a view of the city skyline from picture windows. Junior suites are larger with an open floorplan that includes a living/sleeping area, a small kitchenette and views of the skyline from picture windows. 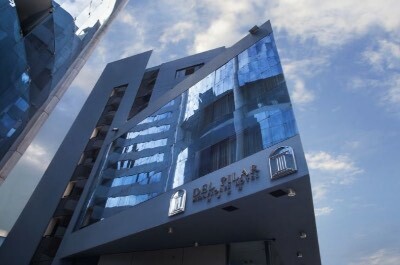 The Del Pilar Miraflores Hotel is a great place to start you adventures with numerous attractions within walking distance that include Parque del Amor, the ruins at Huaca Pucllana, shopping at the Indian Market and you are less than 1-mile from the Costa Verde where you will find Playa Makaha as well as Playa Waikiki. 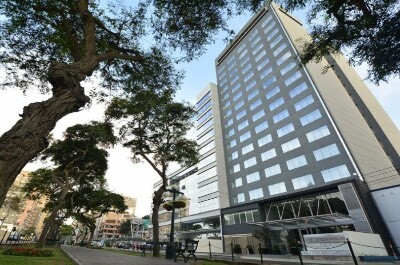 The Del Pilar Hotel in Miraflores has a fitness center and massages are available onsite. Dining includes 24/7 service at the Aymuray Restaurant and the Sushi Bar serves lunch as well as dinner. Dining offsite is plentiful within walking distance with La Gloria for Peruvian, Panchita serves Latin specialties and Bistro 400 prepares American dishes. Nightlife is an easy walk away with the Crocodile Verde for live performances, Cafe Bar Habana, Bizarro has club dancing. When you are looking for a mid-range hotel in Miraflores that is close to beaches, numerous attractions and offers plenty of amenities for families onsite then the Sol de Oro Hotel and Suites is perfect. Located directly in the Miraflores District along Calle San Martin, the Sol de Oro Hotel and Suites is situated within 3-blocks to Parque Kennedy and 4-blocks to the Costa Verde where you will find Waikiki Beach as well as Playa Makaha. The Sol de Oro Hotel and Suites has a modern twelve story architectural design with 123 rooms and suites that have a fresh contemporary interior. Standard and Superior rooms are sized at 270 square feet with a choice of bedding and a view of the city skyline. Junior suites have 430 square feet with an open floorplan that includes a sitting area, a choice of bedding and views of the surrounding skyline. One-bedroom Executive suites are 861 square feet with a choice of bedding, a separate living room that includes a small kitchenette (microwave and refrigerator) and views of the city from floor to ceiling windows. One-bedroom Deluxe suites have a similar size and floor plan with an added terrace that contains a hot tub. Grand Deluxe suites are slightly larger at 914 square feet with a separate living room/dining room, small kitchenette, private terrace that has a hot tub and floor to ceiling windows that offer skyline views. The Solo do Oro Hotel and Suites is a perfect spot to start your explorations of the area with several attractions within a 0.5-mile walking distance which include the ChocoMuseo Miraflores, Larcomar Shopping Center, Parque del Amor and the Virgen Milagrosa Church. The Sol de Oro Hotel in Miraflores has a rooftop freshwater swimming pool with a terrace, a fitness center and a full service spa onsite. Dining includes a complimentary breakfast buffet and there is Murano Restaurant that serves lunch as well as dinner. Offsite dining choices within an easy walk are numerous including Rafael for Peruvian dishes, Maido prepares Japanese and Rigoletto Lima serves Italian. Nightlife within a short walk includes the Delfus Taberna Bar, Son de Cuba has live music and there is gambling at the Fiesta Casino.